Following a wedding, there are few places on the planet more idyllic, intimate and luxuriously restorative than the Cyclades Islands in Greece. Here, alluring whitewashed facades of sloping seaside villages contrast the effervescent sea and sky. Winding cobblestone paths lead down to serene sun-kissed beaches that are interrupted only by dramatic cliffs and gentle waves. Lose yourself in the land of the gods and goddesses, as you wander from ruin to taverna in pursuit of pure and utter bliss. Begin your new marriage with hearts full of love, after ten impossibly romantic nights in Greece. Arrival in Greece, the land of the mythical Gods and ancient civilization. At Athens International Airport you will be welcomed by your private driver and taken to your five-star hotel. Enjoy your afternoon and evening exploring the vibrant culture and nightlife of Modern Athens. Ask your Leisure Travel Consultant for their favourite Athens restaurants, cafes and entertainment. After breakfast, your licensed English speaking guide will meet you at your hotel lobby. Begin your tour at the new Acropolis Museum and then visit the Acropolis itself and its timeless temples of Parthenon, Erectheion and Athena Nike. A short climb up to the Hill of Philopappus brings you to the imposing Roman period funeral monument and extensive views of Athens and Piraeus. You then descend to the hill of the Pnyx, the area used in Classical Athens as the meeting place for the democratic assembly. You enter the historical Plaka area close to the Thiseion temple, dating back to the 5th century BC, meandering past the ancient Agora with the impressively restored Stoa of Attalus, Hadrian’s Library, and the picturesque Tower of the Winds. The route back leads up over the Areopagus, or Hill of Mars, directly below the Acropolis. Here, in 54 AD, Saint Paul preached his Sermon on an unknown God, as recorded in the Acts of the Apostles. Finally, you pass the Roman period Odeion of Herodes Atticus, which is still used as a summer venue for open-air concerts and theatrical performances. Your tour will end at Syntagma Square where you can enjoy the changing of the Guard at the Tomb of the Unknown Soldier. Discover Ancient Delos and its legends. Our private tour will guide you through the Agora, the Sacred way and the Temple of Apollo. You will anso admire the 2.500 years old Mosaic floors and the Avenue of the Lions before returning to Mykonos and the Mykonian Spiti for the unique experience of the cooking class which will provide the rest of the day an experience you will always remember. Take to the skies above Mykonos on this private, 30-minute helicopter tour. With your professional pilot pointing out all the main sights, drink in breathtaking panoramas of the Aegean Sea and Mykonos’ golden coastline. Then, fly over the tiny, UNESCO World Heritage–listed island of Delos, part of the Greek Cyclades Islands, and be wowed by bird’s-eye views of its well-preserved ruins. 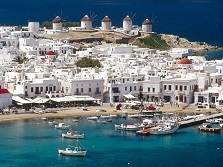 After breakfast, meet your transfer in the hotel lobby and drive to the port of Mykonos to board the hydrofoil for a three hour ride to Santorini. Upon arrival in Santorini, you will be greeted at the port by your driver and taken to your hotel. Enjoy dinner at your leisure, try one of the numerous restaurants while sipping wine from one of the local wineries. Sip you way around the island on a private food & wine tour of the Santorini’s countryside. Enjoy a divine combination of food and wine, carefully selected by our Sommelier. Visit wine estates and have dinner at a traditional 'taverna'. Leisure, enjoy your romantic retreat. Lounge by the pool or indulge in a spa treatment. After breakfast, meet your transfer in the hotel lobby and drive to the port of Santorini to board the hydrofoil for your three hour ferry to Crete. Upon arrival in Crete, you will be greeted at the port by your private driver and taken to your five-star hotel. Enjoy the evening at your leisure exploring the natural wonders, local culture and history of Crete. Enjoy gourmet champagne breakfast. The day is at your leisure; perhaps enjoy an aromatherapy couples massage. Enjoy gourmet champagne breakfast. The day is at your leisure; perhaps lounge by the beach and enjoy Watersports. Dinner This evening enjoy a romantic four course candlelit dinner at your hotel. After breakfast, transfer to the airport where you will check-in for your flight home. After breakfast, meet your transfer in the hotel lobby. Transfer to the Vlyhada Marina of Santorini or fly to Athens and transfer to Glyfada Marina to meet your private yacht. At the port you will be greeted by your captain and crew. Embarkation and safety briefing before you start your afternoon sail in the Aegean, taking in the spectacular views. Enjoy your days at sea enjoying the islands, marina, private coves and deep blue seas of the Aegean at your leisure.